My son loves to build rockets. He woke up late one night when he was about two years old. Daddy was watching the movie, Apollo 13. He stayed up and watched the entire movie. Ever since then he has said he wants to be an astronaut when he grows up. When he was about three years old, Daddy took him to his first rocket launch. That was the beginning of his love for rockets. Soon, Daddy brought home a rocket kit. They spent hours at the kitchen table working on this rocket. You can’t imagine the pride in his eyes when it was completed. They went to a local rocket club the next month and launched the rocket that they had built. My son’s face just lit up when his rocket lifted off. As soon as it hit the ground he was running out to get it. “Again, again,” he cried. Over and over again they launched their rocket that day. Since that time my son has built many many rockets. 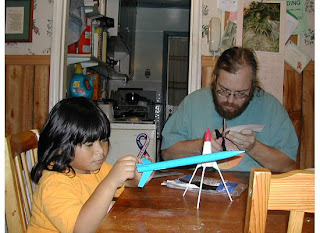 He brought home a pile of scraps from rocket club one day and put them together to build a rocket. Now he designs and builds all of his own rockets. This is such and exciting way to learn homeschool math and science.